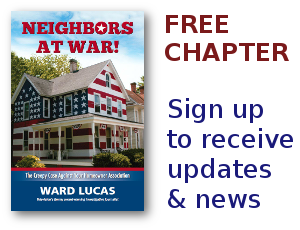 Free Speech Archives - Neighbors at War! It’s that time when signs, signs, and more signs will be seen. Signs of all sizes and colors will start to appear. The exception will be in the HOAs where the restrictions apply to size, location, lighting, and dates for display. Count on the HOA board to have their cronies watching your every move with a political sign…unless the board president happens to be supporting the same candidate. Then it will most likely be okay to have your sign out whenever and wherever you’d like. Rules seem to only apply to the supporters of the candidates the board dislikes. Sorry about getting behind on my Neighbors At War blogs but I have been slogging through this Denver blizzard. At first I didn’t think it was such a big deal, but that was before I got my Blazer and my snowplow stuck in ditches. Oh, and trying to dig out neighbors has been a huge stress producer. This really wasn’t much in terms of a Denver blizzard. We had one in March of 2003 that left snowdrifts up to twenty feet high. But this one, despite being just a couple of feet, is the wettest snowfall I’ve ever seen.